Did you know that Mick and Mimi did an infomercial together before the Magic Bullet? 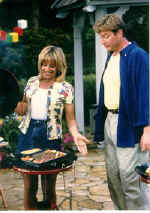 It was for a product called the Red Devil Grill and it featured Mick and Mimi hosting a barbeque for their friends, making it a precursor to the Magic Bullet series. The reason I’m writing today is because I didn’t see this product mentioned on the site. Back in the late 90s (1997 or 1998) Mick & Mimi pitched something called the Red Devil Grill. That’s actually where I knew Mick & Mimi from, years before the Magic Bullet. Unfortunately it’s just a distant memory and I’ve yet to find any information on the infomercial itself. I’m sure someone has to have it on tape somewhere. I used to but I discarded my VHS tapes years ago. You may have known about this, but it’s been bugging me for years since I’ve been sucked in to the Magic Bullet fandom that this “prequel” if you will has been lost to time. I remember the infomercial was in the same vein of the Magic Bullet infomercial where Mick & Mimi were throwing a party, guests were expecting food, but they wanted to show how fast, quick, and easy it was to use this grill. It turns out the grill was recalled back in 2002 due to fire hazards and was never made again. If you have heard of it, my apologies, but if not, I was hoping you could make a plea to the other infomercial enthusiasts out there to see if anybody has a copy. I’d love to see it again. Thank you Vinz for letting us know about this forgotten infomercial classic. I remember this infomercial quite well but I think the product got recalled pretty fast so I don’t think it was around for long. Hopefully somebody can find this gem somewhere. Btw, Paul have you ever thought of making a dvd of the best infomercials? I’d be first in line to buy a copy! oh man, this is big news!! I remember this product. I thought it was pretty neat. I think there might have been a camping scene where Mick and Mimi make breakfast on the grill. I don’t have a copy; I’m writing this purely from memory. @Kyle L. Varnell I`d be second in line! Yeah that is Mick and Mimi. I scored the music to that show, as well as the magic bullet(and countless others). The Red Devil aired in 1998, and sold quite well I believe. I think back then it was under Quantum Television. I myself have been trying to find this show online too. To be honest, I’m not sure what happened with the product. This archive of an internet discussion has a brief description of Mick and the Red Devil Grill. “my favorite one went off a few years ago, because evidently, it was a fire hazard. 😮 it was the red devil grill. the best scene was when the one guy was grilling like two burgers and a hot dog on a normal grill, and mick (red devil guy) had like twelve grills, all cooking at the same time, and they kept claiming that ONE red devil grill could cook 5435455 times as much food as one normal grill. I just bought a brand new Red Devil Grill (never been used anyway) off craigslist. can’t wait to try it out. apparently it was in storage for many years. I just bough one of these at a thrift store for CHEAP. I recently cooked some brats on it and it was delicious! I still have the Infomercial of Mick & Mimi Presenting the Red Devil Grill on a VHS tape, BUT I don’t have a VCR and a DVD Recorder. I just can’t bring myself to buy or borrow a VCR, including a DVD Recorder. but if I can borrow both VCR & DVD-R. I will put it on YouTube. I own this for years and use it every summer (beach, parks) works like a champ it still is clean never had the fire problem as i am aware of it and make sure to keep an eye on it… got it for free! and best part is easy to lug around…but now i’m thinking of the small coleman on the market…as my replacement have had this grill for over 6 years….best money i never spent! 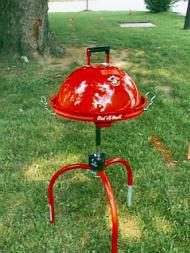 THE RED DEVIL GRILL WAS RECALLED IN 2002. IF YOU RECENTLY BOUGHT IT, SEND IT BACK OR GET THE RECEIPT SO YOU CAN RETURN IT FOR A REPLACEMENT. it was recalled because the stupid company (E4L) sold the product with flammable paint and refused refunds. i handled the customer service calls. people lost decks, walls, and many had to go to the hospital with burns. I have one from I think 1999…mind you that was never used. The bag fizzled apart from age. The reason I never used it was because when I attempted to put it together there was a valve missing. I called to have the product exchanged and they said no. They told me to call the manufacturer who didnt help me either and refused to send me any part – they didnt know what to send and couldnt help me. So this piece has been missing for 14-16 years and I never got to use the grill. Service was not very good. I still have a grill that I cannot use. Given that you’ve reviewed all the Magic Bullet infomercials, Paul, will you be reviewing the Red Devil Grill one as well? Yes, I plan on reviewing it. Best portable grill… had it for 15yrs and the heat plate finally calapsed (that’s the curved plate with the holes that goes over the burner when grilling)… but that’s on me as I cleaned the grill like a self cleaning oven… cranked up the heat, put the lid on… at 400+ degrees I would scrape off the ashes then put the food on… never had an issue. In my opinion, most, if not all of the recall non-sense is from careless idiots. The grill is on a tripod morons. It will tip over in high winds and unlevel ground and if bumped into. To avoid most tipping issues, simply strap a lead shot mesh bag to the legs (available at most dive shops) and problem solved… bags can go into the grill bag with the grill, duh. Man there are some really stupid people in this country and the politicians actually listen to these idiots… This is a sound product that actually did everything you saw in the infomercial. I brought it everywhere (beach, tailgating, pool parties, birthday parties at the parks, camping, you name it. It is extremely efficient and portable. I hooked up a 20lb tank to it from an adapter I got at K-mart. Best grill I ever owned. Will buy another one soon online. Wonder what they did with the recalls… having 2 or 3 of these is awesome for big fantasy football and superbowl parties. I am still looking for a different version of is infomercial that features me riding a bike while having the red devil on my back, and sitting by a stream next to the red devil. Please email me if you find this version! I have had mine for over 15 years – still using today! I would love to find another one! Please help me find another one! Matt – if you happen to see this – I take the deal! It my second one, had this one in storage. I have one, brand new, never used but carrying case is a little bit soiled. $100.0 and it’s yours plus you pay shipping. I bought Red Devil years ago. Could not find the enclosed pamplet. Just setting up for the first time and I look forward to using it regularly as I love outdoor cooking. Thanks for the infomercial.